In one of my recent posts, I talked about a few of the body image issues that I am currently facing, and to be honest have faced my whole life. I try so hard not to let social conventions of what I should and shouldn't look like bother me but sometimes I just can't help it. Let's just say I've started to do a lot of my shopping online and I feel myself falling deeper into the dangerous lack of self respect chasm. I have come across a few lovely articles and quotes lately that I think are so wonderful and are how I wish I could view myself. I'm definitely not trying to sound up myself here, but I think self love is something that we shouldn't be ashamed of. Sure, there are about a million things I would love to change about myself, but I don't want to become one of those women who are obsessed with their appearance and become ridiculously shallow and can't seem to focus on anything else. However, in our society, I honestly find that a really challenging thing. Everywhere I look, I find myself wishing I could have someone else's specific body parts other than my own. I would love to wear particular clothes in summer that some girls can, but I know that I just wouldn't feel comfortable. I admire girls who don't care what other people think of them and wear what they want no matter what people might think or say. But that's not me. As I've said before, I'm trying really hard to be more positive in all aspects of my life, and I think the place that I find this to be the most difficult is when I talk about myself. Or to myself. My brain is ultimately stuck in an endless cycle of negative self-talk and this is one of the hardest things to break. It's been explained to me using the example of someone riding a push bike on the exact same track, around and around and around for years. In order to go on a different route, they have to push through all the grass and debris that surrounds the well worn, easily ridden on road and the effort of doing this is so difficult that they almost always return to the easier path. I find this really easy to relate to, as when I try and be internally positive about my appearance, I almost always find it ridiculously difficult and will follow it up with a negative thought. I have treated my body like crap a million times. I have drunk far too much alcohol, eaten processed, fatty, fried foods that I know are bad for me, have deprived myself of adequate sleep and done other things that I'm not proud of and that are definitely not good for my body. The fact that I realise this though, has really helped me on this journey that I am only just beginning - treating my body with the respect it deserves. That's not to say that I have cut out doing things that I enjoy, like the occasional drink and the occasional (sometimes more than occasional..) piece of chocolate, but even though I struggle to perceive myself in a positive way, I am slowly realising that I deserve to love myself for who I am, and not to waste my time wishing away what I have for an idealised notion of "perfection". 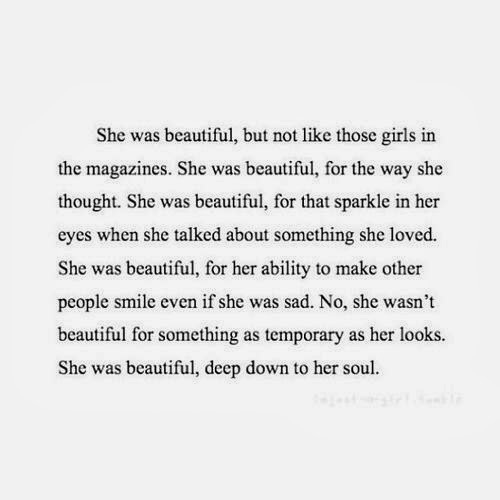 I found this quote online, and this is the type of "beautiful" that I am striving to be, the type of beauty that is truly not artificial, the type of beauty that lasts forever, the type of beauty that hopefully I can one day recognise in myself without immediately crushing that recognition with yet another negative thought. Inner beauty shines through to the beauty you are outside and then you just have the most gorgeous person all over. YOU!! !